Westpac and its subsidiary St.George will be among the first banks in the world to provide their customers with mobile banking at the touch of the wrist through Apple’s ground breaking Apple Watch. 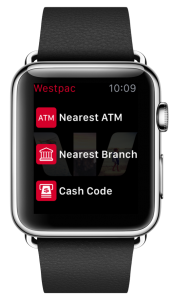 The service will provide Westpac Group’s customers with access to a range of mobile banking services on their Apple Watch, including quick and easy access to account balances, finding their nearest ATM or branch, and receiving travel notifications at the airport to advise the bank of their travel plans. “Providing customers with a variety of ways to manage their money, whenever and however they want is a priority for us, and the latest iteration of that is Apple Watch,” said Westpac’s General Manager Digital, Harry Wendt. St.George’s CIO Dhiren Kulkarni said their latest offering will provide ease and convenience for the increasing number of customers who are now banking on the go on smart devices. “We know our customers like being first with the latest technology and we’re extremely excited to be first to market with rolling out our mobile banking app at release of the Apple Watch. The St.George app brings pleasure to banking and makes banking tasks simple and convenient with features like Quick Balance, where customers can quickly view their account balances directly from their wrist watch,” Mr Kulkarni said. Westpac Group has released a myriad of innovative mobile banking solutions for their customers in recent times, including: Fingerprint Logon on Android and iPhone, the Get Cash service which enables customers to withdraw cash from a Westpac ATM without a card by having a code sent to their phone, Westpac contactless payments as well as overseas travel notifications and Global Alliance overseas alerts to notify customers of their nearest Global Alliance partner ATM. According to the media release by Westpac Group, to use banking on the Apple Watch customers will need an iPhone 5 or above with iOS 8.2 or above that is paired with their Apple Watch.